Fresh and neutral the Cameo range has feminine appearance finished in stone off white. The Cameo bedside table has ideal versatility, suiting many decors, the perfect addition to your bedside. The Cameo bedside table has a neat, square like design which will sit beautifully by your bedside. The surface top sits at the perfect height, holding all your necessities on its spacious top within easy reach. Three neat drawers are ideal for all your bedside essentials. A modern twist on a traditional shaker style. The Cameo bedside table introduces a soft touch to your space with its delicate off white finish. Clean lines combine with elegant sloped legs to create a versatile design with a feminine touch. A great choice for all spaces as the neutral appearance of the Cameo bedside compliments a variety of room decors. 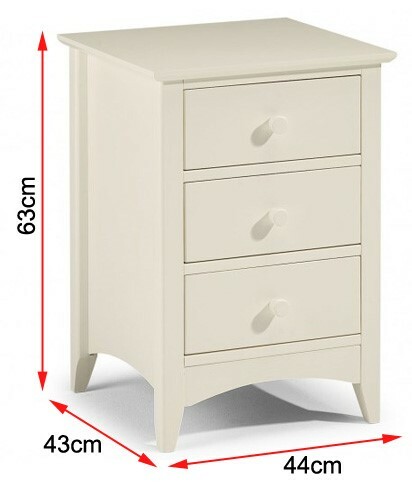 Constructed from MDF this bedside table is strong and sturdy. The off white finish is a smooth lacquer, enhancing the bedsides durability. Simply wipe over with a duster or dry cloth to maintain a pristine finish. For tougher marks such as mug rings try a warm damp cloth before resorting to chemical cleaners. When moving your new bedside tables always lift to avoid incurring any accidental structural damage. This bedside table will be delivered flat packed and self-assembly will be required. The instructions are easy to follow and as this is a smaller item assembly can be managed by one person.